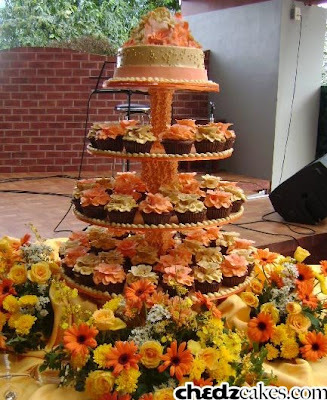 Christine wanted to have minicakes to serve as give-aways for her guests. 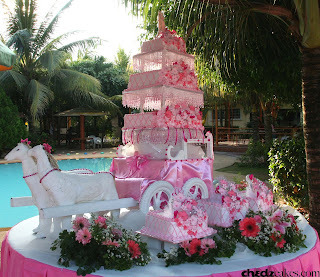 We used baby pink ribbons and roses to decorate the minicakes. 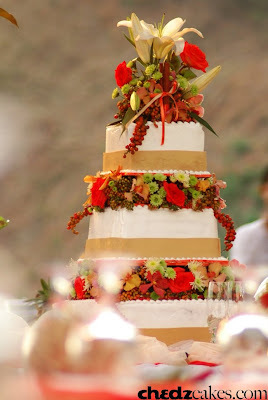 Then we placed the big cake for slicing on top, adorned with a topiary of roses. A tropical-themed wedding cake with fondant icing, sugar flowers and gumpaste seashells. Shot by Rolando Pascua at Imperial Palace Resort and Spa in Mactan, Cebu. "hi miss chedz! hazel here. your client last feb. i hope you still remember me. anyway, i'm sending you pictures of your beautiful creation (as promised). everybody was admiring your cake. until now i am so grateful that you made the cake. the wedding went perfectly well. from flowers to reception and program everythng was perfect. can't ask for more. 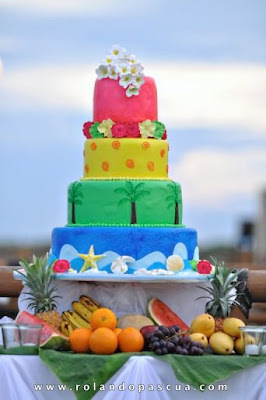 oh by the way, the cake blends amazingly to the reception and with a chocolate fountain and fruits on the side... wow! it was the best.. can't help but admire it. not to mention the taste was extremely delicious. moist and not too sweet. so again thank you very much. 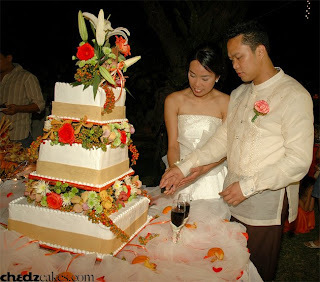 i have a friend here getting married in cebu next year and i told her to consider you as her vendor. i hope you'll meet her. again, thank you and god bless." 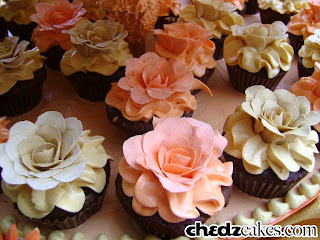 They chose chocolate marble and mocha flavors, alternating each layer. 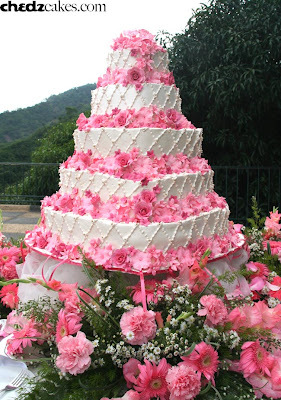 We used an assorment of sugar flowers (roses, hibiscus, four o'clock, five petals) in different shades of pink. 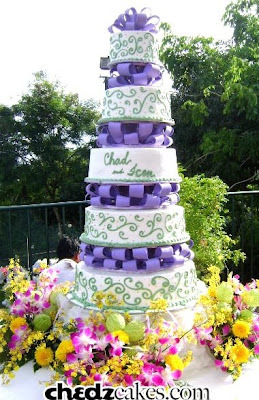 The cake was covered in boiled icing designed like a quilt. Thus the quilted hearts title. 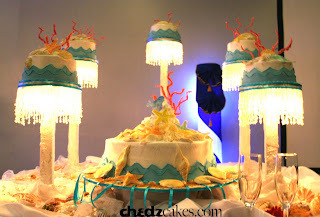 The motiff for this wedding was purely blue and white. The couple didn't want to use any other color. 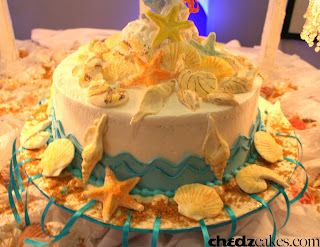 Their cake was covered in powder blue icing with white scrolls. 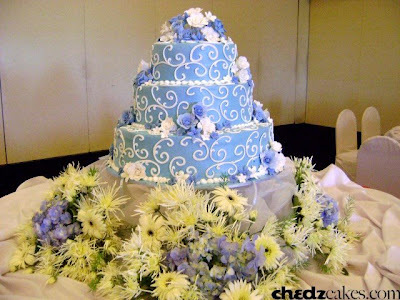 Then we topped it with a topiary of blue and white sugar flowers, also added in little bouquets of sugar flowers on the sides. 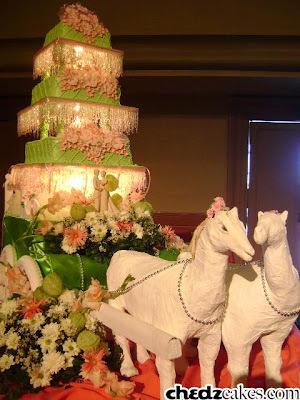 Here's another version of our carriage cake. The motiff was lime green with light pink accents.